Without hiding their pride, the people of Split will tell you that their city is “the most beautiful one in the world and beyond”. You’d better not discuss this with them for well spirited Split will convince you in this as soon as you discover it! This for ever young city with the population of about 200,000 that give it its warm Mediterranean temper, has lived its urban rhythm for as long as 1700 years, with its heart in the Diocletian’s Palace and its soul widespread to embrace you. 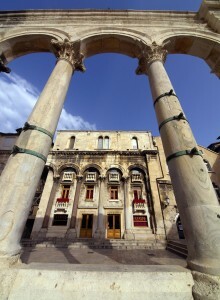 Ever since the life of the city protected by the UNESCO and entered into the register of the World Cultural Heritage has been wrifing the history of this unique capital of Dalmatia. 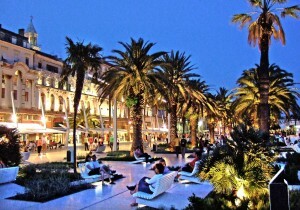 The city of Split is situated in the warmest region of the northern Mediterranean coast, in the very centre of the Adriatic eastern coast and in the immediate vicinity of the rivers Jadro and Žrnovnica that have been watering it for 1700 years. Its mild climate, with 2700 sunny hours per year, makes it an oasis where, sheltered from the wind, one can enjoy the sun even in wintertime. The industrial, university, and business centre of the region nourishes its “green soul” on the hill Marjan situated in the westernmost part of the peninsula. Its forested park infringed by the city and the sea offers pleasant walks away from the city noise under the pines by the sea. The city at the foot of Marjan can be reached by The Adriatic Coastal Road, winding by the sea or by hinterland roads connected to Split. It will take you 5 hours to get to Zagreb and 4 hours to get to Dubrovnik in your car. You can also reach Split if you get on a coast ferry liner from Rijeka or Dubrovnik, from all central Dalmatian islands. There are excellent fast and regular ferry lines from Ancona and Pescara, Italy. From the Airport Split flights connect the city witb Zagreb several times a day, as well as with European capitals. There are also trains from Split to the north of the country and further on to Europe. You can transport your car by train, as well. The first inhabitant of Split was the Roman emperor Diocletian who started to build his palace in this triendly bay around 293 AD. After his abdication he withdrew to this luxurious palace of about 30 thousand square meters. The following turbulent centuries made the palace into a town first populated by the citizens of the nearby Salona, fleeing before Avars and Slavs. The town overgrew the walls of the palace and its authorities kept changing-from Croatian kings in lOth century AD, Hungarian and Venetian administration, to French rulers and Austro-Hungarian monarchy. Such past left its traces combined in the town everyday life. The city, however, went on remaining the centre of this part of the coast till our day. This mixture of historic layers brought some clumsiness and some things done too fast but today all that makes a part of its originality. The big city today lives by the silent beats of history, lively spirit of the young and its particular Mediterranean charm. T HE CULTURAL OFFER in this city-museum is an endless story leading from the streets in which history lives with the breath of the present. There are museums, galleries and spaces where, for a moment, you can feel as a participant of the famous centuries the traces of which you are following with your steps. Beside the city hotels or outskirts ones, there are great possibilities of comfortable accommodation in luxuriously furnished and fitted family houses and apartments. Wherever you go during your tourist or business stay in Split, look for a good konoba (wine cellar) or fish restaurant, where fruit of the sea and sea food dishes will offer an unforgettable joy to all your senses. Don’t forget genuine Dalmatian brandies-lozovača and travarica to start with. After such aperitif, be sure to taste Dalmatian pršut (smoke-and­wind-dried ham), salted sardines or cheese kept in oil, roast or boiled lamb, pašticada s njokima (stewed beef served in Dalmatian gravy sauce with noodles). The dishes are nicely followed by famous red (Dingač, Postup, Faros, Babić) and white (Pošip, Maraština, Grk, Bogdanuša) wines. Make your meal sweet with rožata (Dalmatian pudding) or kroštule (traditional fried pastry) and make a toast to it all with sweet desert wine prošek, a result of grapes and the sun. 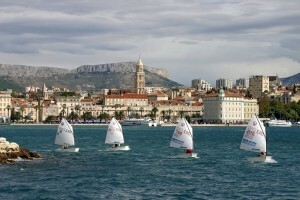 Few cities can offer such variety of entertainment and excursions in their closest surroundings as Split. At the very entrance to the city there are ruins of the ancient Salona, once the capital of the Roman province Dalmatia and the biggest archaeological locality on the eastern Adriatic coast. Just a bit further away stands the town of Trogir, entered in the UNESCO register of the World Cultural Heritage, which two-millennium-old history is woven in modern life of this town-museum. North of Split, on the way to Sinj, rises the fortress of Klis. It was built to defend this region from the Turkish invasion. Having passed the fortress you enter the hinterland that offers the possibility to enjoy in riding, rafting and canoeing down the white waters of the Cetina River. There are three big Marian shrines only 30 km away from Split dedicated to Our Miraculous Lady of Sinj, Our Little Lady of Solin and the shrine at Vepric. 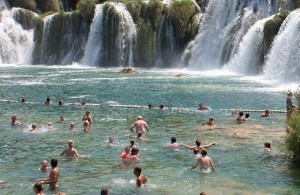 The world famous shrine Medugorje in Bosnia and Herzegovina, is 130 km away from Split. If you set off to the sea, the routs will take you to Hvar, Brać, Vis. These are the islands of rich history and tradition, unique beauty and natural phenomena. One of them is the sea cave Modra špilja on the island of Biševo, where the sunrays break turning the sea into blue silver. SHOPPING – There are a lot of shops, department stores and a range of small authentic galleries, souvenir and antique shops in the alleys within the walls of the Palace. In the middle of the summer these tiny streets stay in the shade coolness of stone walls. You can find huge shopping centres at the outskirts of the city.